IDIL Fibres Optiques provides custom end shaping optical fibers (polish, cleave, lens, splice) for best coupling efficiency between the fiber and its waveguide. 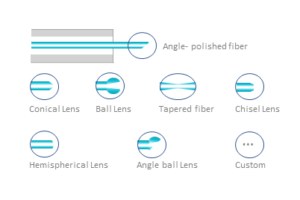 Contact us for specific micro shape of the fiber end: angle polishing, angle lens, conical lens, conical lens with flat top, tapered lens, ball lens, ball lens with large working distance, wedge angle (screw driver) lens, prism lens, 8° to 45° face angle lens, graded index, cleave, splice and others. IDIL is expert in simulation, realization and characterization of custom micro polished fibers. IDIL micro shaping techniques and equipment allow great flexibility in parameters such as fiber type, fiber length, protection, termination, operating wavelength, focus spot size, operating temperature. 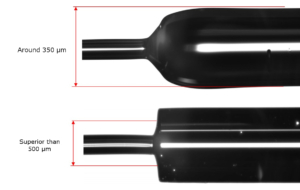 The ability of getting a mode diameter bigger than 200 µm leads to high positioning tolerance, high coupling ratio and high power handling. Lensed fibers work by adapting the mode field diameter to improve the mode matching between the waveguide and the fiber. IDIL shape the fiber and the core to create optimal light output/input for specific applications.